While everyone else was returning to work after the Christmas break Dylan and I had an extra week off to enjoy some downtime and make the most of summer before kicking off another busy year. And while everyone else was at work the smart thing to do was book a long lunch at a restaurant with water views. 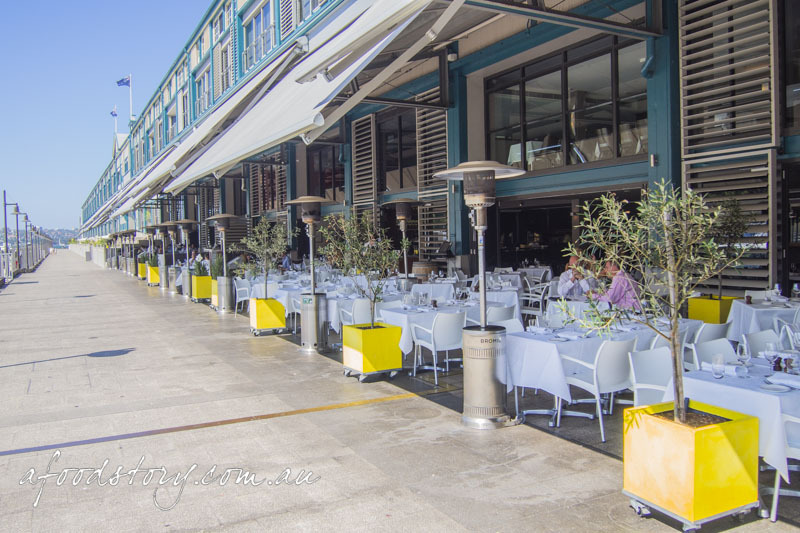 Located on the waterfront at Woolloomooloo wharf Otto was the obvious choice. Owned by the Fink Group who also own Quay and co-own The Bridge Room, Otto has been a mainstay of the Sydney dining scene for the last 15 years. The food is modern Italian and the setting picturesque. With both indoor and outdoor dining options you’d be mad not to dine outside on such a glorious summer’s day. 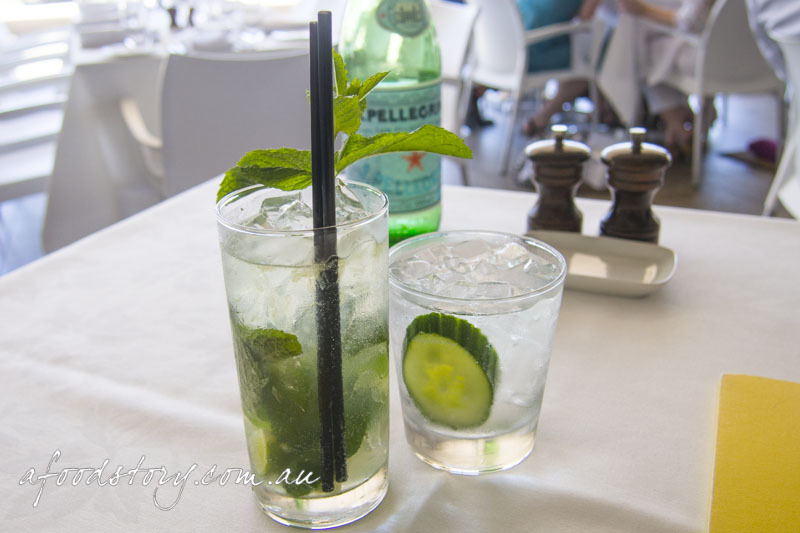 Mojito ($19.00) and Hendrick’s gin & tonic ($19.00). Protected by the sun and with a cool breeze coming off the water, dining al fresco never felt so good. It had been close to ten years since we’d last dined at Otto and we were well overdue a return visit. We felt lucky to be dining in such a sensational setting both mid-week and during the day when the restaurant is less crowded. Being the middle of summer a few cocktails were in order – a favoured mojito for him and a refreshing Hendrick’s gin and tonic for me. Affettato – truffle salami, San Daniele Prosciutto, wagyu bresaola, pork crackling ($29.00). 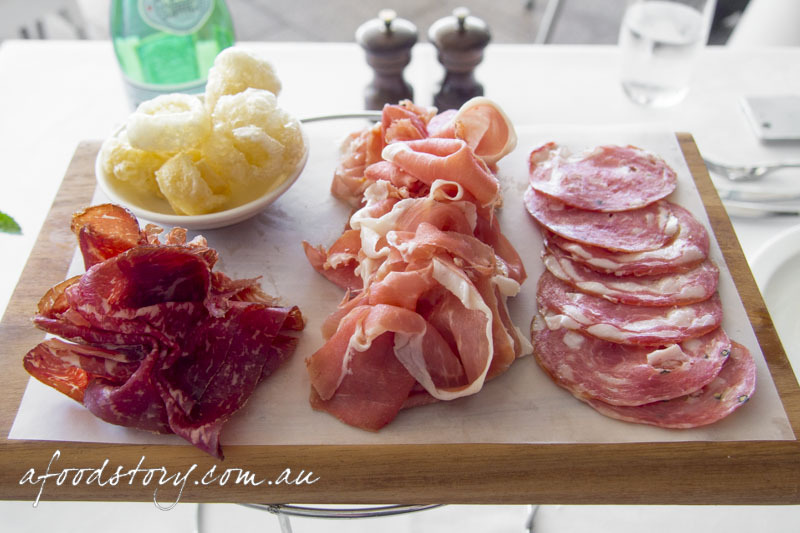 A meal at an Italian restaurant has to start with salumi or antipasti. It’s the rule. Ordering from the ‘assaggi’ section of the menu (which comes before the Antipasti and translates to ‘tastings’) we chose the cured meats because no one does them better than the Italians. A large cheeseboard with the selection of meats was cleverly placed on a pizza stand to leave room on the table. Salami had a lovely mix of fermented pork and chunks of pork fat punctuated with black peppercorns and decadent, earthy truffle. Prosciutto had flavour in spades and was sliced to the perfect thickness making each piece an event in itself. Wagyu bresaola had as much flavour as it did depth of colour, cured with such a deft touch it was meltingly soft and rich at the same time. A great offset to the silky cured meats was pork crackling. It didn’t just bring texture and crunch it was utterly moreish. 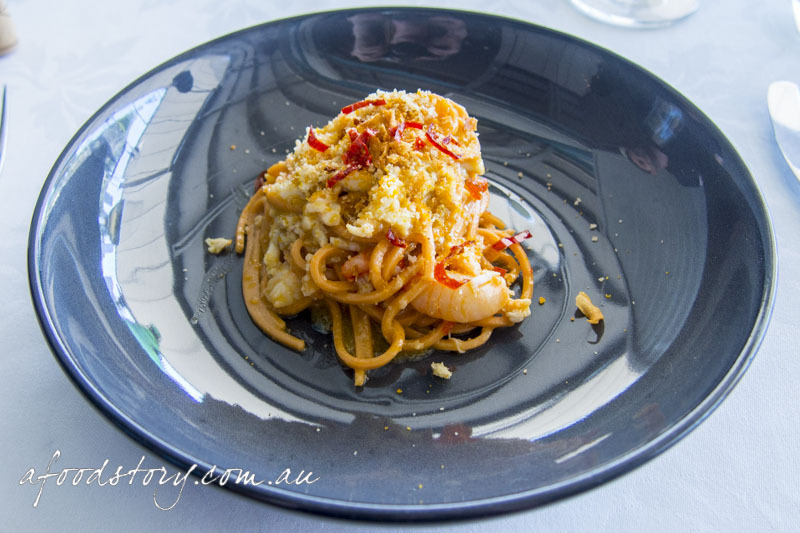 Spaghettini – tomato infused fresh egg long pasta, spanner crab meat, chilli, garlic, bread crumbs ($30.00). Moving on from the ‘assaggi’ next up had to be ‘paste’ and it was the promise of spanner crab that saw me order the spaghettini. Beautiful long fresh egg pasta was reminiscent of hokkien noodles with a similar shape and rich orange hue, but it was the amalgamation of the ingredients that grabbed focus in this dish. Crab, chilli, garlic and bread all work so well together and with such sensational, hearty pasta at the core everything was able to live up to expectations. An exceptional dish. 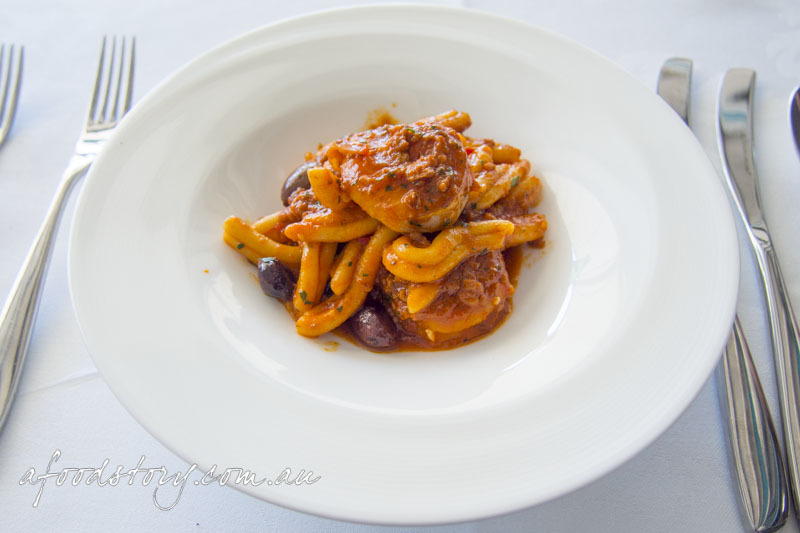 Strozzapreti – twisted pasta, king prawns, garlic, chilli, black olives in a tomato and calamari sauce ($30.00). Dylan also ordered pasta but opted for the bolder flavoured strozzapreti (which really does translate to ‘priest strangler’ due to its unique shape, reminiscent of a priest’s collar). Again we had superbly cooked al dente pasta coated in a tomato and calamari sauce which is made with a tomato passata and minced calamari to add another level of dimension to the sauce. Tossed with perfectly cooked prawns, garlic, red chilli, black olives and fresh basil it offered such a rich umami feel that Dylan loves so much, he was in heaven. This is a dish that has been on the menu for a very long time and for good reason. 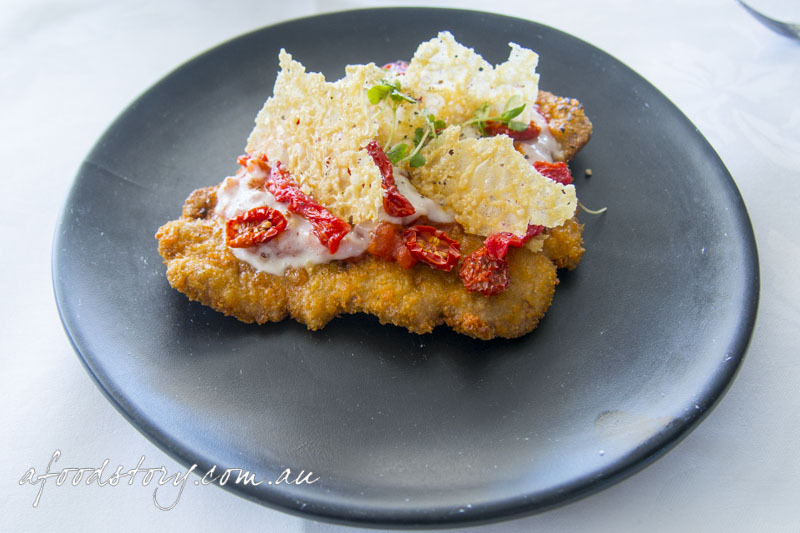 Vitello ‘Parmigiana’ – crumbed veal backstrap, napolitana sauce, buffalo mozzarella, semi-dried cherry tomatoes, parmesan crisps, basil ($40.00). If you thought a platter of cured meats and pasta would lead to dessert you’d be mistaken. We set out for a long lunch and we intended to make the most of it. For main it was the parmigiana for me. Parmigiana is one of the greatest fried foods on earth. It’s often done poorly but when done well it can make you realise why plain old schnitzel is not always enough. Veal backstrap was flattened, crumbed and fried to perfection. Showing great restraint the level of sauce offered allowed the stunning veal to remain the star of the show. Buffalo mozzarella was melted over the top and then the dish got a little fancy with semi-dried tomatoes that added a sharp tomato element – sweet and full of flavour, with parmesan crisps adding both colour, texture and saltiness. It was a twist on an Italian classic too often bastardised in pubs. It was an outstanding rendition. 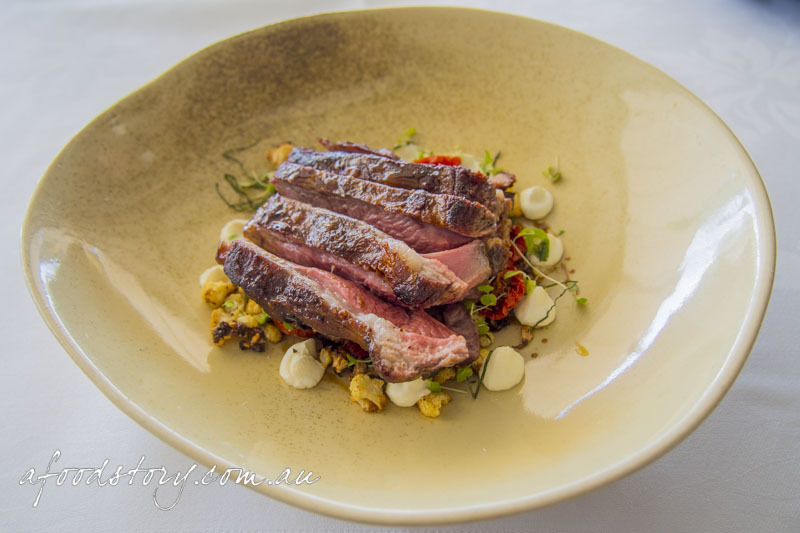 Agnello – White Pyrenees lamb rump, roasted cauliflower, semi-dried tomatoes, yoghurt, 10 year old balsamic, mint ($43.00). More often than not Dylan will order beef so it’s nice to see him order something different for a change. The lamb rump was sliced and laid on a bed of small pieces of heavily roasted cauliflower. Blobs of yoghurt dotted the dish but it was the blushing pink of the lamb rump, cooked just to our liking that was in the limelight. Shards of mint and healthy hits of semi-dried tomato did so well to extend the flavours of lamb produced by the charred skin, melting fat and juicy meat. There was a lot going on but in such a calm and precise way it would outplay many beef dishes. 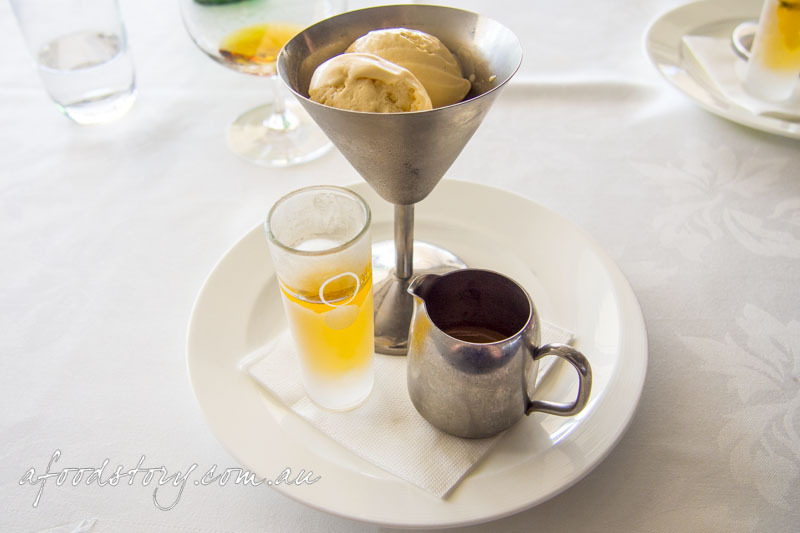 Affogato – vanilla bean gelato topped with espresso, Nocello liqueur ($19.00). When it comes to dessert it’s not often that Dylan and I are on the same page. But with the sun beating down neither of us fancied a heavy dessert and both opted for an affogato; a dessert the combines gelato with both alcohol and coffee. At Otto you don’t get one measly scoop of gelato. Heck you don’t get two. You get a generous (and delightful) three scoops of heavenly gelato with visible flecks of vanilla and a silky texture. The espresso shot was decent for a restaurant (the Italians generally get espresso right) and the Nocello, an Italian liqueur made from walnuts and hazelnuts, served in a chilled glass and ample to ‘drown’ the gelato with a rich nuttiness, reminding me that affogatos really are a marvellous thing. And so we came to the end of our long lunch. Best friends, incredible food and an outstanding location, you can’t ask for much more than that. Head chef Richard Ptacnik may not be Italian but he sure knows how to cook it. 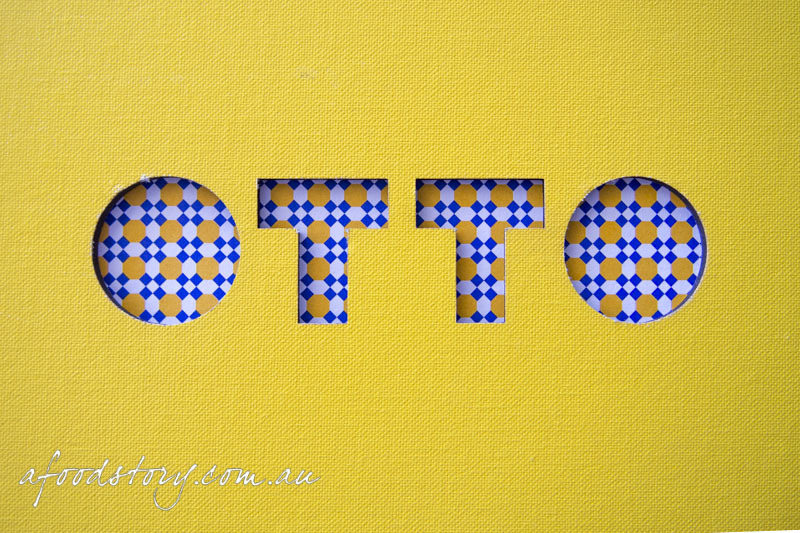 The food at Otto is traditional Italian with a slight twist, and Sydney is all the more better for it. We just need to plot our return before another ten years passes us by.